Newcastle Clinic is proud to support Sir Peter Mansfield, inventor of the MRI scanner, as the face of Britain’s new £50 note. The Bank of England last month asked the public to nominate a British scientist to feature on the note, and we believe this contribution to healthcare and society is a well-deserved nomination! The Bank of England received 174,112 nominations for the £50 note in less than a month and recently released a list of 992 eligible nominees that it’s considering. To be eligible, the individual must be real, deceased and have contributed to a field of science in the UK. The final choice will be made by Bank of England governor Mark Carney in 2019. Other figures put forward include Margaret Thatcher, Stephen Hawking, Ada Lovelace, Alan Turing, Rosalind Franklin and Dorothy Hodgkin, as well as Magnus Pyke and Marie Stopes. 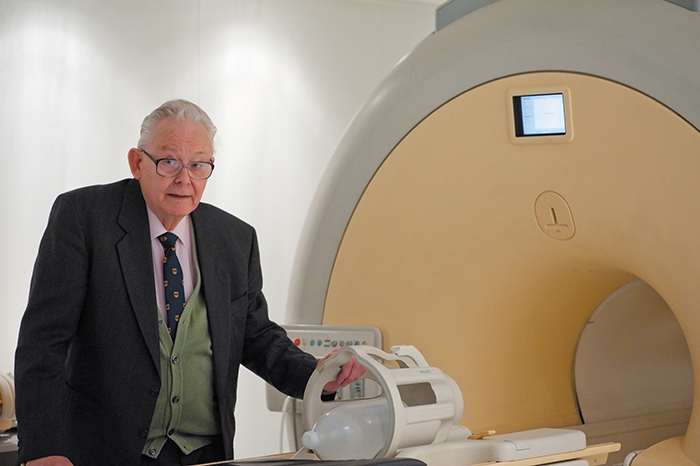 MRI scans were developed by Mansfield at the University of Nottingham in the 1970s, and he was the first ever person to have an MRI scan in 1978 – despite warnings that it could be dangerous. The first ever MRI scanner, the Mark 1, was used on a patient for the first time on 28 August 1980. MRI scans create 3D images of the body’s internal organs without radiation by utilising strong magnetic fields and radio waves. Today, the machines can help doctors detect cancer, disorders and can even help diagnose ADHD, schizophrenia and Alzheimer’s disease. Mansfield was awarded the Nobel Prize in Physiology or Medicine in 2003, which he shared with the inventor of the technique, US chemist Professor Paul Lauterbur. The scientist passed away in February 2017 at the age of 83, and the MRI scanner was recently announced as the third greatest British invention on a list of 100 entries. Mansfield left school at the age of 15 before beginning his career at the University of Nottingham, which now boasts the Sir Peter Mansfield Imaging Centre in his honour. Now, the University of Nottingham has backed the inventor’s nomination to be on the new currency. His wife, Lady Jean Mansfield, 83, is calling on people to support her late husband’s nomination, who she said came from a working class, deprived background. “Don’t fight on the streets, fight in the classroom – everyone is capable if they work hard. Do you think Sir Peter Mansfield should be the face of the new £50 note? Let us know on Facebook or Twitter!